Bighorn Sheep posing beside the road. 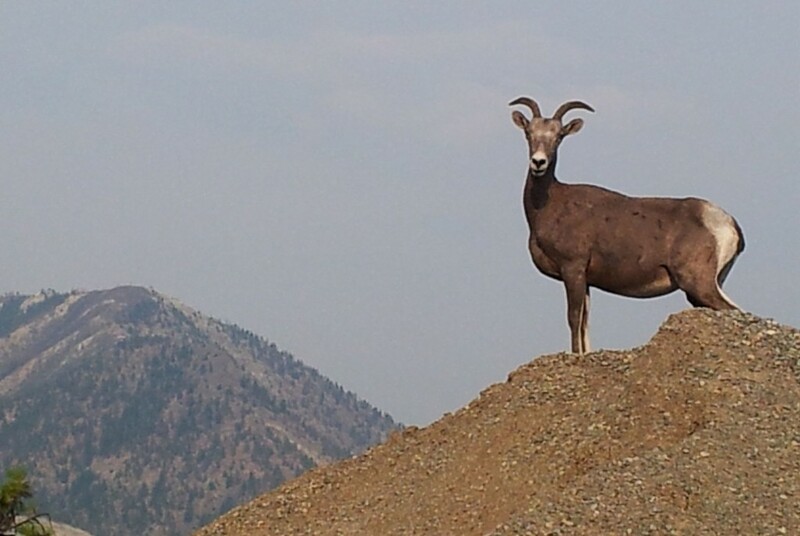 We could hardly believe it to find this Bighorn standing on the top of a gravel pile on the side of the Botanie Creek Road. She had a small one with her – I can’t bring myself to describe it as a lamb since what I saw was a long way from what I know as a lamb. The car inched forward towards the gravel pile and we snapped away from the vehicle. Is this not a breath-taking creature, standing tall and standing proud. Wonderful. Looking towards the Stein Valley, on road from Lillooet to Lytton. Yesterday we drove to a nearby town, Lillooet. By British standards it wasn’t near at all. Lillooet is an hours drive on a road which in places hugs close to the mountain side. Single lane in one place…!The mighty Frazer River wide and gushing forth in a ribbon flows at the bottom of the valley. On our return journey in the late afternoon the mountains towards the Stein Valley Nlaka’pamux Heritage Park stacked up in classic pose painted shades of blue/grey . Scenery is moving and changing and to capture it in a moment is to tell a fraction of its majesty. I find myself uncomfortable in my attempts yet here they are. Images – perhaps they bring stillness as one views them. Stay awhile and take them in as you would in meditation. From Rogers Pass, Glacier National Park on Trans Canada Highway. 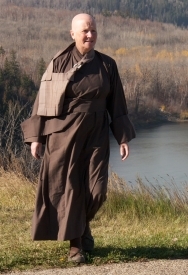 We left Edmonton Thursday lunchtime and arrived here in the area of Dragon Flower Mountain Temple late Friday evening. Just before Calgary where we were hosted for the night there were golf ball size hail stones falling from the sky denting cars and wrecking awnings. Fortunately the storm was ahead of us. From Banff National Park for most of the journey on the Trans Canada Highway until we reached Rogers Pass we had heavy rain to contend with. Can I say I was somewhat saddle sore after so many hours on the road. Thank you folks for sticking with Jade and the erratic postings. My priority while traveling and visiting is to be with the people I am with and to take care to get adequate rest. But as I write I see that it is almost tomorrow! Be well (and well rested). You be well too dear friend. Be seeing you.